Nuclear War destroyed our Earth in 1964. 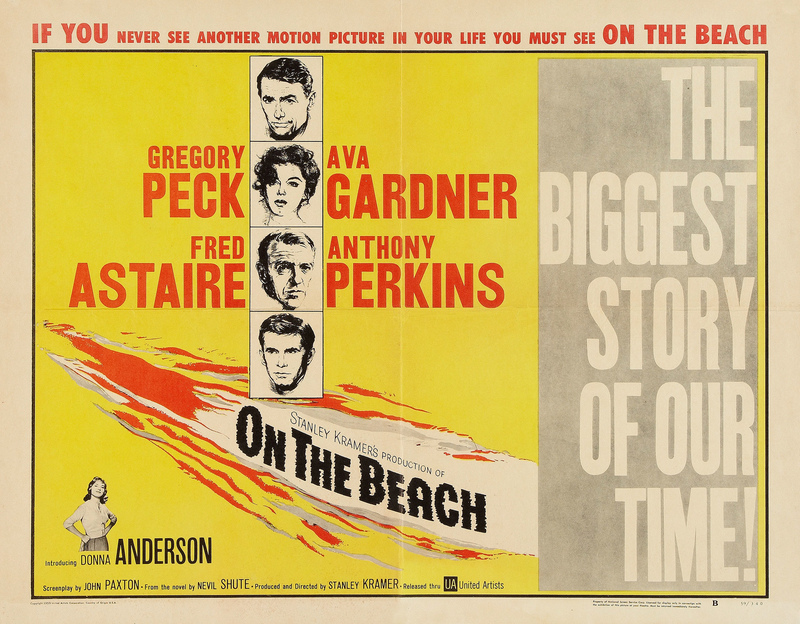 Along with other members of a motion picture audience I watched Stanley Kramer's "On the Beach". I was born in what was called "The Dawn of the Atomic Age" in 1946 and it should have scared the crap out of me, if I wasn't a baby. Even my parents had no real idea what had finally been created in 1945. What were a few people killed in Hiroshima and Nagasaki to America? They were our enemy! They had killed Americans and deserved to die! Besides World War 2 was ended and my future father was home. That was all that counted in homes across the United States and our Territories. How little did we know and that included the men and women who let that Atomic Genii out of it's bottle. On March 7, 1947 Metro-Goldwyn-Mayer released a motion picture about the creations of and dropping of those first two atomic bombs. It's final title was a question: "The Beginning or the End?". The idea for the movie originated in 1945 with 24 year old actress Donna Reed and her old High School science teacher Edward R. Tompkins. Reed was not in the MGM production, but actor Brian Donlevy portrayed General Leslie Groves and Hume Cronyn was Dr. Robert J. Oppenheimer. Forty-Two years later Paramount Pictures, who had been offered the original story idea by Reed and Tompkins before MGM, released their version of the Atomic Bomb's creation "Fat Man and Little Boy". That picture starred Paul Newman as Groves and Dwight Schultz as Oppenheimer. Neither film really captures this story as the one written by General Groves and his staff. 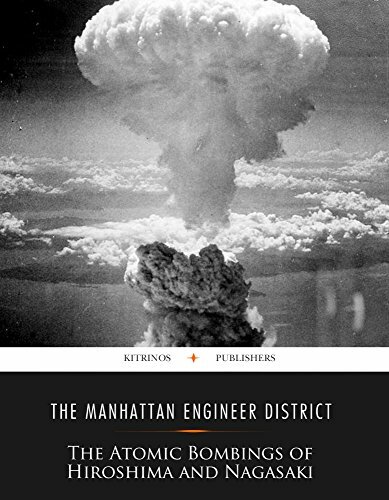 In a very well written report entitled "The Atomic Bombings of Hiroshima and Nagasaki" by "The Manhattan Engineering District". The report speaks of the creation of the bomb and the almost day by day frustrations. It provides readable statistics for the layman, or in this case General Groves' superiors in the Army and Congress. Along with what those two Atomic Bombs actually did to those two Japanese cities based upon available, non-classified information, at the time. You can find it as a free E-Book/. This article is a look at several motion pictures made in Hollywood and other countries imagining what we didn't know about. That is what a nuclear holocaust really would be like and it's aftermath? Imaginations ran wild and some of it was really far out in hindsight, but then "That's Entertainment!" Some of the publicity for Science Fiction Motion Pictures built itself around that standard drama tag line of the 1940's and early 1950's: RIPPED OUT OF TODAY'S HEADLINES! As I write this article the idea of Nuclear War and its aftermath is terrifying to people around this globe we call the Earth. The average person in the streets of America, in the early 1950's, had no idea that images of the devastation of Hiroshima and Nagasaki were really any different than from the other bombs dropped during that war on say Berlin. The Eisenhower Administration kept the details secret as I grew up. We did hear stories and have Civil Defense drills and that formed some of the basis for the movies I plan to mention in this article. To illustrate my point! Just nine years and four months after the Atomic Bomb was dropped on Nagasaki, Japan, above. 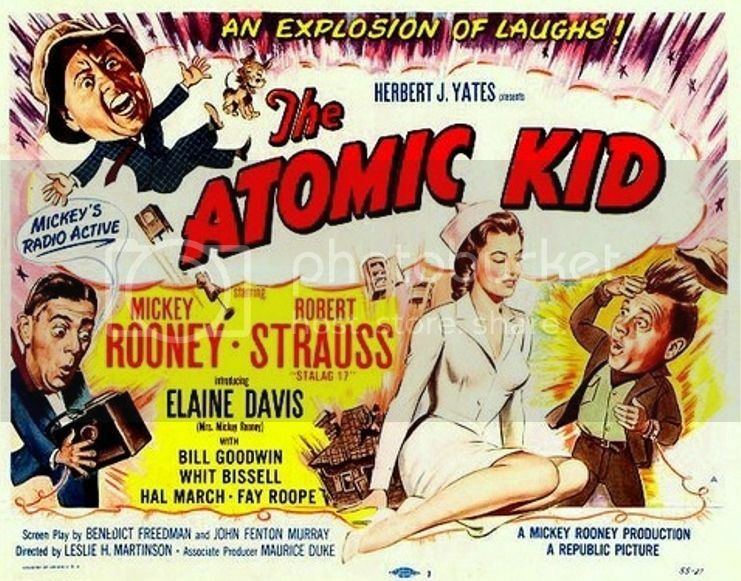 On December 8, 1954 a movie starring Mickey Rooney, Robert Strauss and Elaine Davis opened across the United States. 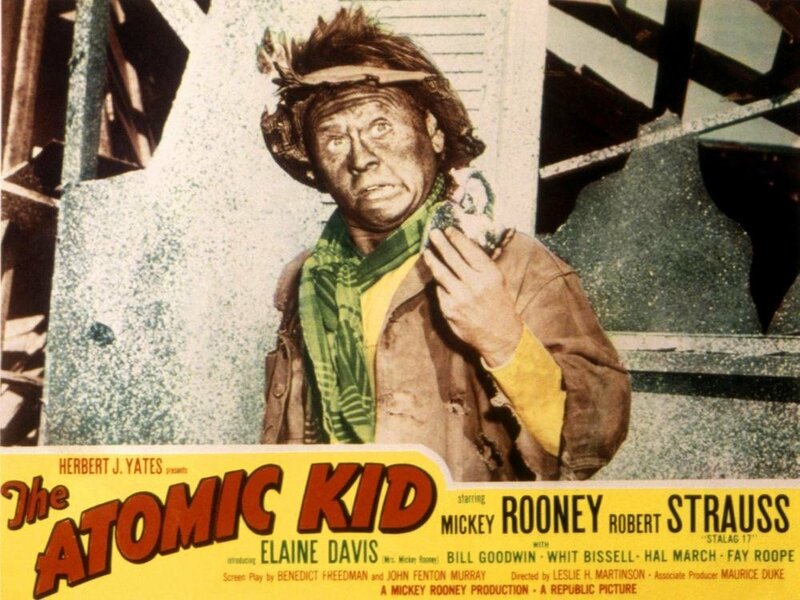 The story was by Blake Edwards the writer for television's "The Mickey Rooney Show" and this comedy was "The Atomic Kid". Mickey Rooney played a down on his luck silver prospector, in Nevada, who finds a housing project for shelter. What he does not know is its an atomic test site. Rooney's character does notice the dummy people, but the kitchen refrigerator is full of real food and he decides to make a sandwich. As he starts eating it the Atomic Bomb is set off. According to Blake Edwards' story line. Mickey Rooney survived the blast because he was eating a peanut butter sandwich. The story has the Peanut Butter company promoting their product with Rooney at one point. The films was a prime example of our lack of knowledge of what an Atomic Bomb really could do and the attitudes in America toward it. Although in Los Angeles there would be those Civil Defense siren tests every week and I was having "Drop and Cover" drills at my elementary school. Where I went under my desk and curled up into ball. Again based upon our knowledge of the bomb. This was to prevent me from being hurt had an Atomic Bomb been dropped on Los Angeles. While we American's laughed at Rooney's antics! Across the Pacific Ocean, one month earlier, a motion picture from the Toho Studio's opened dealing in its own way with the flip side of "The Atomic Kid" and the real horrors of Hiroshima and Nagasaki. "Gojira" was an allegory of the Atomic bombs dropped on those two Japanese cities and an incident with a fishing trawler called "The Lucky Dragon #5". 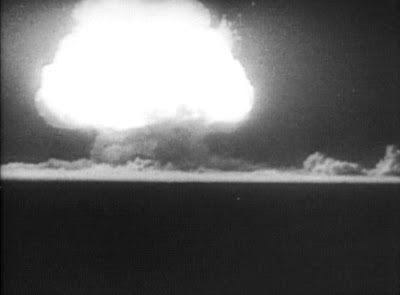 The allegorical Atom Bomb was the prehistoric monster of the picture's title. Two year later in 1956 the terror of "Gojira" would be changed into a typical 1950's giant monster on the loose movie and released in the United States. The original motion picture was re-edited with additional American footage as "Godzilla, King of the Monsters". It would be another three years, 1959, until the originally conceived picture, with English subtitles, played anywhere in the United States except an Asian theater. That change in the film's story had the purpose of preventing friction between American's still remembering World War Two and the Japanese American population we had placed in "Relocation Centers" for the length of World War 2. Additionally the Americanized picture stayed away from the idea, as implied in "Gojira", that American scientists were responsible for those two Atomic bombs and what followed in Hiroshima and Nagasaki. The following films reflect Hollywood's imagination to convey what was thought would happen with a nuclear strike and the warnings they gave us. Some of these films by today's standards are down right silly and others still hold their message. To begin I want to talk about one film from 1952 that reflected American's fears of the Soviet Union at the start of the "Cold War". With a Tag Line by popular newspaper columnist Hedda Hopper. 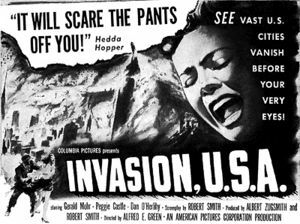 "Invasion, U.S.A." was a little motion picture that delivered with a solid "B" cast of actors. The story was simple. A group of people who have never met walk into a New York City bar. The three leads are Gerald Mohn portraying television news anchorman Vince Potter, Peggie Castle as Carla Sanford a New York society women down on her luck and Dan O'Herlihy playing the mysterious Mr. Ohman sitting away from the others. Supporting them are four other actors completing the bar group. They include Robert Brice as George Sylvester a California Industrialist, Wade Crosby as Illinois Congressman Arthur V. Harroway, Erik Blythe as an Arizona rancher and Tom Kennedy as Tim the Bar Tender. I give you all the actors and their characters to set up for my readers the microcosm of America that screenplay writers Robert Smith and Franz Schultz created. This group start to talk among themselves. The talk goes to agreeing they all don't like communism and don't seem to appreciate their own material wealth being an American gives them. The conversation also brings up a want for lower taxation and not seeing why the government has to support everything. At this point in the discussion Ohman, swishing the brandy in his large glass, adds that American's want safety and security, BUT do not want to make any sacrifices to obtain and keep those two goals. Suddenly on the television comes a report that "The Enemy", unnamed but obviously Soviet Russia, has staged a full scale attack on Seal Point (Aleutians East) and Nome, Alaska. Next we see paratroopers landing on a military base and a female communications officer being killed. The movie next follows each person in the group as they attempt to return home, or in the case of Vince Potter report the Invasion as military bases in the United States are wiped out by Atomic Bombs. The audience witnesses American cities destroyed in Nuclear War. In short we watch America's worst Cold War fears play out as one by one the group from the bar dies in different invasion related circumstances. The last to be killed is Carla Sanford. Her death happens when a group of "The Enemy" dressed as American military break into her apartment and she jumps from the balcony. As Carla falls around her the scene swirls and she appears inside Mr.Ohman's brandy glass. Which he is still swirling around and everyone is in the bar again. Ohman is a hypnotist! He had the others experience their worst fears and realize they are worth something. 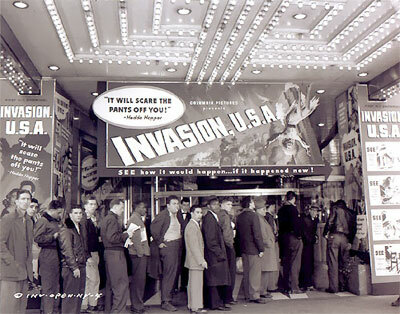 Today, looking back at "Invasion, U.S.A." a person may laugh at the story. However, if you're from my generation and heard those Civil Defense sirens going off. Experienced "Drop and Cover" drills not just at schools, but in the work place. Read, or heard about the activities of the "House Committee on Un-American Activities" and Senator Joseph "Tail Gunner" McCarthy and his Communist Witch Hunts. The picture was frightening in its own way. It is no wonder that one's mind set might lean toward distrusting even your neighbor as being a possible Communist agent. A point made in Government publications and broadcasts. All creating fears of Soviet Russia and the potential of a nuclear attack at any moment. However, it was documented that from the end of World War 2 through the first half of the 1950's. Out of a population of 150 million American's at the time. Less than 50,000 were members of the Communist Party. Yet the Federal Government would have us think otherwise. 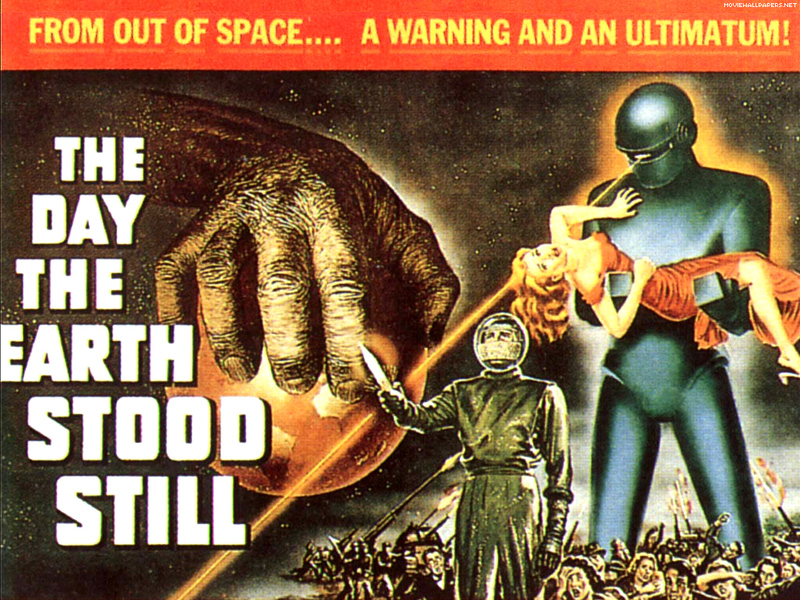 First released on September 18, 1951 Robert Wise's "The Day the Earth Stood Still" remains a classic continuing to be watched 66 years later as I write these words. The motion picture works on several levels. The first is it's great science fiction story telling with a strong script and equally strong cast. However, "The Day the Earth Stood Still" is also a subtle look at the same fears expressed in "Invasion, U.S.A." about the Soviet Union and nuclear war. From "the heavens" comes a messenger Klaatu. He lands in Washington, D.C. after circling the earth several times in his flying saucer. That alone has caused fear and panic in the world population. That fear will be clarified at a simple rooming house breakfast as its source being the Soviet Union. Earlier after his ship lands it is surrounded by the army with all the weapons possible at the time including tanks and howitzers. 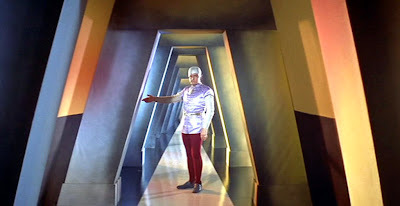 When the hidden door opens and out walks Klaatu wearing his spacesuit the tension mounts. As he reaches for an object, which will turn out to be a means of predicting weather for the United States President, Klaatu is shot by a soldier reacting out of his own fear of the unknown. When Klaatu leaves Walter Reed Army Hospital to "go out among the masses". Fear grips the United States and the scene at the boarding house takes place. Yet, in all appearances Klaatu looks just like you and I, but it is that fear that your next door neighbor may be a Soviet agent that goes through the minds of both the characters on the screen and those in the audience. The Visitor will befriend a widow's son at the boarding house. A boy who is looking for answers and is the only one that sees the Spaceman as a possible friend, or a means of gaining knowledge in the film. "The Day the Earth Stood Still" comes with "a miracle" as everything that is powered suddenly stops at noon for one hour, but planes in flight still fly and hospitals and their related work still goes on. Klaatu is not here to kill us as we fear, but to give the world a message of either hope, or destruction. It all depends on how we interpret it. At this point after revealing himself to the boys mother. He gives her instructions should sometime happen to him. Klaatu's "sermon on the mount" takes place as he stands on his spaceship looking down at a group of gathered earth scientists from all over the world. It is the unless the earth people's stop making nuclear weapons and killing one another. The planet and all it's population will be destroyed for the good of the other inhabited worlds. A subtle plea to the 1951 audience against nuclear proliferation and testing. There is another underlining subtle plot to the picture that many viewers still have never gotten. I ask my reader to look at the words I have put within parenthesis, "the Heavens", "go out among the masses", "a miracle", "resurrection" and "sermon on the mount". Additionally Klaatu takes the name of the army officer whose clothing he uses, "Carpenter". Director Robert Wise and screenplay writer Edward H. North have created an allegory of Jesus Christ revisiting earth. He walks among us, but not one person of supposed faith recognizes him. He has become the unknown we fear. A fear the ordinary American's at that breakfast table turned into an agent of the Soviet Union. We kill Jesus a second time, because of that fear. A group of four men and one women are launched from the White Sands Proving Grounds, the site of the 1944 "Trinity" Nuclear Test, in Rocketship Expedition-Moon (Rocketship X-M). Something goes wrong and the space craft's crew find themselves not orbiting the Moon, but Mars. 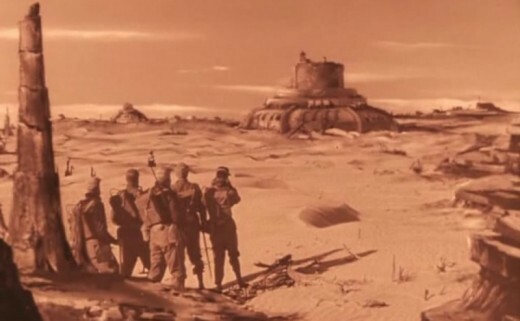 The ship is landed on the Red Planet and it is here that the movie goes nuclear when the crew explore. They find that the Martian civilization has been destroyed by a past Nuclear War and this is confirmed by residual radiation. A plot point first seen in this movie, but will be carried through in other Post Apocalyptic screenplays. The crew is attacked by the now primitive people and there are deaths and injuries to the group. The survivors make it back to the ship and take off for Earth. It is discovered that because of the change is destination there is not enough fuel to make it back to Earth. A garbled message gets through, but the warning to mankind about Atomic War does not as "Rocketship X-M" crashes into Nova Scotia. 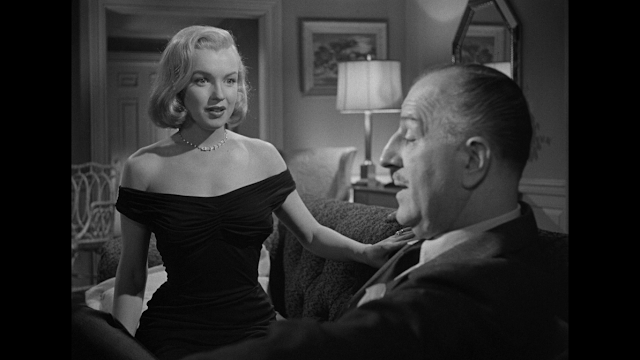 "FIVE" premiered on April 25, 1951 from a story and screenplay by it's producer/director Arch Obler. Obler was known as the main writer/producer of the horror radio program "Lights Out" from 1936 through 1939 and then it's one year revival 1942 to 1943. Those stories still scare today. Obler would produce/direct and write the first commercial 3-D motion picture "Bwana Devil"in 1952. 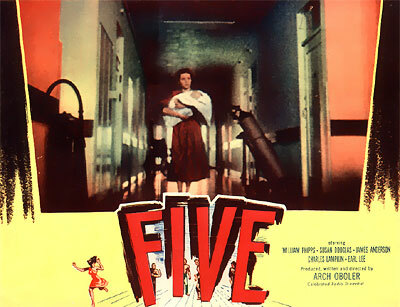 "FIVE" is considered the first true Nuclear Holocaust motion picture made World Wide and like "Rocketship X-M" set a concept that would be used throughout the 1950's in science fiction motion pictures. 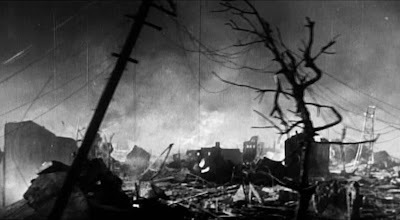 Behind the opening credits for the picture is the explosion of an Atomic Bomb and with the film's one word title is quite effective. Obler introduces the audience to his "Five" survivors of an nuclear war. We meet pregnant/married Rosanne Rodgers. She was in a hospital's X-Ray room that with its lead lined walls protected her. We meet Michael who is at Rosanne's Aunt's isolated house when she arrives. He had been in an elevator of the Empire State Building when the bomb went off. We meet two more survivors an elderly Bank Clerk named Oliver P. Barnstaple who is being taken care of by an Afro-American named Charles. The two were in a bank vault when the attack came. The fifth person found on the beach is named Eric. He had been flying back from Mount Everest, where he had been climbing at the time of the attack, and his plane ran out of gas. The reasons for Obler's group to survive an Atomic war fit what was known at the time and that included how radiation from the bomb was supposed to work. Looking back from today my reader would be shaking their head, but again one has to remember how little was known even by the scientific community, for sure, in 1951. The bank vault survival idea was used by Rod Sterling in Episode 8 of Season One of his "Twilight Zone". This was a full eight years later on November 20, 1959 in "Time Enough at Last". It was also about a Bank Clerk. That episode further illustrates 14 years after Hiroshima and Nagasaki the average American's lack of real knowledge of how to survive an Atomic attack and the properties of radiation. "DROP and Cover" anybody? The five people believe they are the only survivors and begin to discuss their options. Eric's ego starts to show as he believes theY'RE all immune to radiation. Shortly after rescuing Eric the Bank Clerk Barnstaple, who had been experiencing sickness, dies. On another front with Eric is that he's a racist and can't stand being around Charles. This idea would be explored in more detail in 1959's "The World, The Flesh and The Devil". 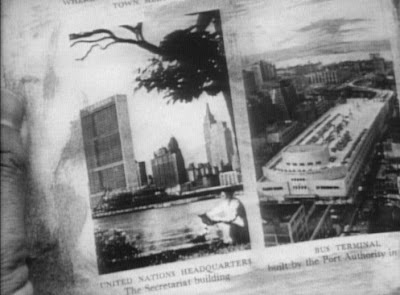 In that major motion picture there are only three survivors of an Atomic War who meet in an empty New York City. They are an African American played by Harry Belefonte, a women portrayed by Inger Stevens and the racist played by Mel Ferrer. The screenplay for "The World, the Flesh and the Devil" by Ronald MacDougall goes farther than Obler dared in 1951. It has white Stevens falling in love with Afro-American Belefonte while Ferrer also wants Stevens. The picture used its post apocalyptic theme to address racial issues not mentioned in most homes of the time. Returning to "FIVE" Eric attacks Charles and while their fighting Rosanne goes into labor. The fight stops and Michael delivers her baby boy. One night Eric talks Rosanne to come with him to the city to see if her husband is still alive. Before they go Charles becomes suspicious of Eric's motives and in a fight is stabbed and killed. Eric and Rosanne go to the city where they discover her husband's skeleton. At this point Rosanne realizes she wants to be with Michael, but Eric won't let her go. The two struggle and Rosanne rips Eric's shirt revealing signs of radiation poisoning. Eric who believed himself immune and superior goes into shock. He turns and leaves her just standing there. Rosanne and her baby start the long walk back to her Aunt's house. As she travels the baby gets sick and dies. Michael appears having been looking for her and buries the boy. The two realize they may be the last people on Earth and face their unknown future. 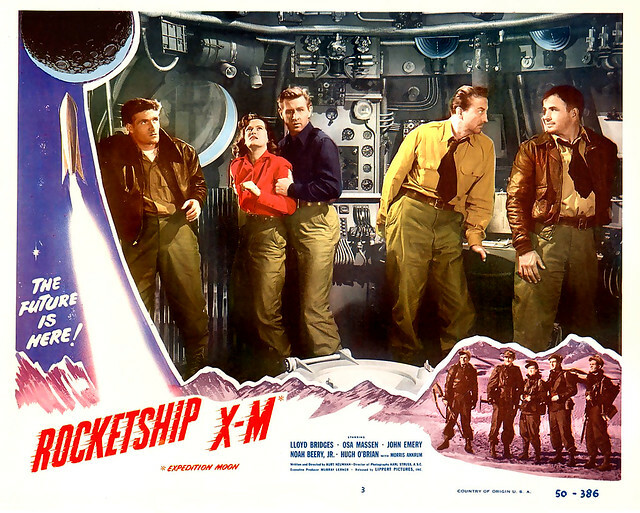 As good as the low budget "Rocketship X-M" was for Robert L. Lippert Productions. "The Unknown World" written by Millard Kaufman was as bad, but the premise was perfect for the minds of 1951 America. A Bomb Shelter for the Human Race. The picture was released October 26, 1951 six months after "FIVE" and became the second movie made to play on our Nuclear annihilation fears. 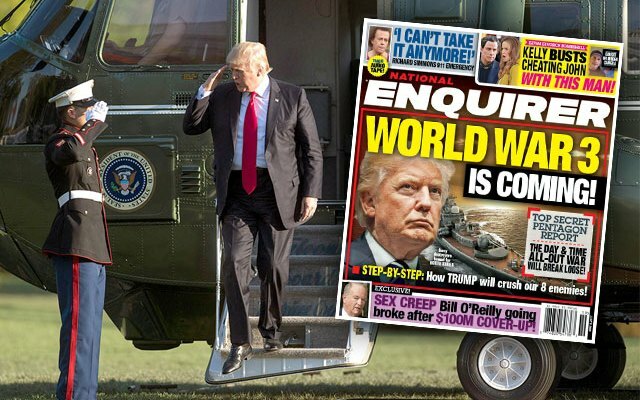 Dr. Jeremiah Morley is concerned about what he perceives is imminent Nuclear War and its consequences for the human race. So Morley puts together a team of scientists to go look within the Earth for a bomb shelter for mankind. Over several subplots, including a romance, the group finds what appears to be the perfect inner world bomb shelter for mankind to survive an atomic cataclysm. There is breathable air, it's own ocean and phosphorescent light. A plot device lifted from Jules Verne's "Journey to the Center of the Earth" as the above movie posters blatantly promotes in this very low budget science fiction entry. However, all the test rabbits give birth to dead babies and an autopsy reveals the animals have become sterile. Dr. Morley's dream of saving us from ourselves is ended in failure as the volcano the group is in starts to erupt and they must escape somehow to the surface. The idea of bomb shelters to save the human race used in"The Unknown World" and joked about in the 1999 movie "Blast From the Past". Had been an actual 1950's salesmanship job by the Eisenhower Administration to those living in the suburbs of America. The product being "Sales Pitched" were "Backyard Bomb Shelters" to save a person's family from a Soviet Atom Bomb attack. As I mentioned above this was the Government's playing on the fears they had help create. The federal government responded to heightened public anxiety by creating the Federal Civil Defense Administration (FCDA), later called the Office of Civil Defense, to instruct the public about how to prepare for a nuclear assault. The Eisnehower administration distributed information to educate Americans about how they could protect themselves. Survival literature was written primarily for a suburban audience, since it was assumed that cities would be targets and most urban dwellers would not survive. 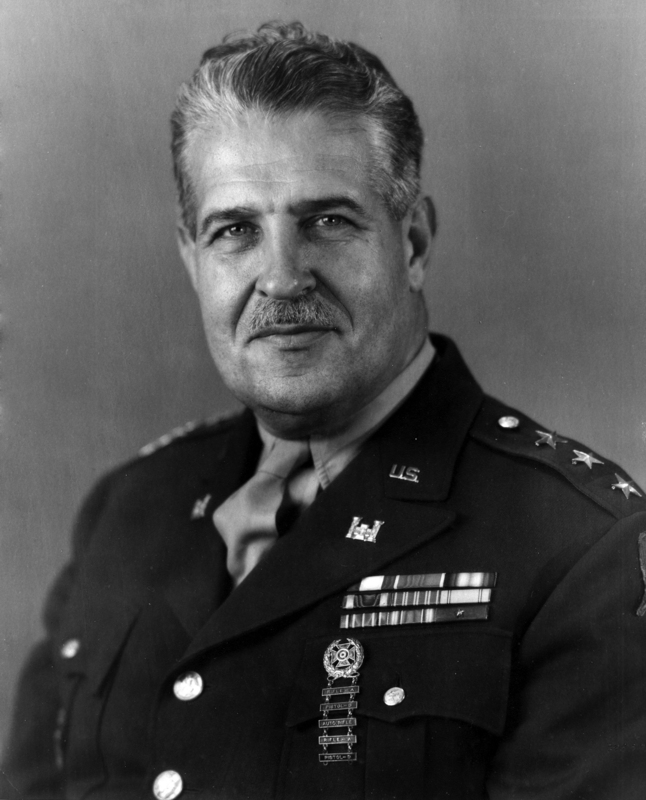 Officials at the FCDA stated that if people were educated and prepared for a nuclear attack, they could survive an atomic bomb and avoid the wholesale death and destruction that had occurred at Hiroshima and Nagasaki. What is a fallout shelter and how were they built? A fallout shelter is a civil defense measure intended to reduce casualties in a nuclear war. It is designed to allow those inside it to avoid exposure to harmful fallout from a nuclear blast and its likely aftermath of radiation until radioactivity has dropped to a safer level. A basic fallout shelter consists of shielding that reduces gamma-ray exposure. Since the most dangerous fallout has the consistency of sand or finely ground pumice, a successful fallout shelter need not filter fine dust from air. The fine dust both emits relatively little radiation and does not settle to the earth, where the fallout shelter exists. Concrete, bricks, earth, and sand are some of the materials that are dense or heavy enough to provide fallout protection. Concrete was the favored building material of fallout shelters, with walls at least 12 inches thick. The required shielding could be accomplished with 10 times the amount of any quantity of material capable of cutting gamma-ray effects in half. Shields that reduce gamma ray intensity by 50 percent include 0.4 inches of lead, 2.4 inches of concrete, 3.6 inches of packed dirt or 500 feet of air. When multiple thicknesses are built, the shielding multiplies.When I was working for the Post Office one Christmas my Supervisor asked another employee and myself if our wives would permit us to come over to his house for a Christmas drink, or two, or three. When got to his house what I found amazing was not that Bob Seaberry made his own beer and wine, but that he made it and kept it in a backyard Bomb Shelter he had purchased in the early 1950'. The picture would be re-released in the United States in 1956 as "Captive Women". "IMDb" has the years reversed causing some confusion, but the above poster confirms the correct sequence of release. When I saw both movies after I had just turned six. The picture was released in the U,K. and Brazil under the screenplay's original title "3,000 A.D.". In 3,000 A.D. New York City there are three groups of survivors of an Atomic holocaust. You have the "Norms" who are still healthy humans and live in the old subway system. "The Up River People" who are a group of "Raiders" that live in the wooded areas surrounding the city and are pretty much also still human. Then there are "The Mutates" who still show genetic deformities from the Atomic Holocaust. However, the story is simple. "The Mutates" capture some "Norm" women and a rescue mission sets out. This will lead to a meeting with "The Up River People" and a joint attack on "The Mutates". However, in "The Mutate's" village there are two factions. One is led by a man saved from death by the "Norm" Leader that is attempting to overthrow the current evil Mutate leader. Battle will ensue and friendships will overcome animosities toward each other. In the end the "Norm" women Ruth marries the good "Mutate" leader Riddon bringing hope for the entire human race and a restoring of faith in God. 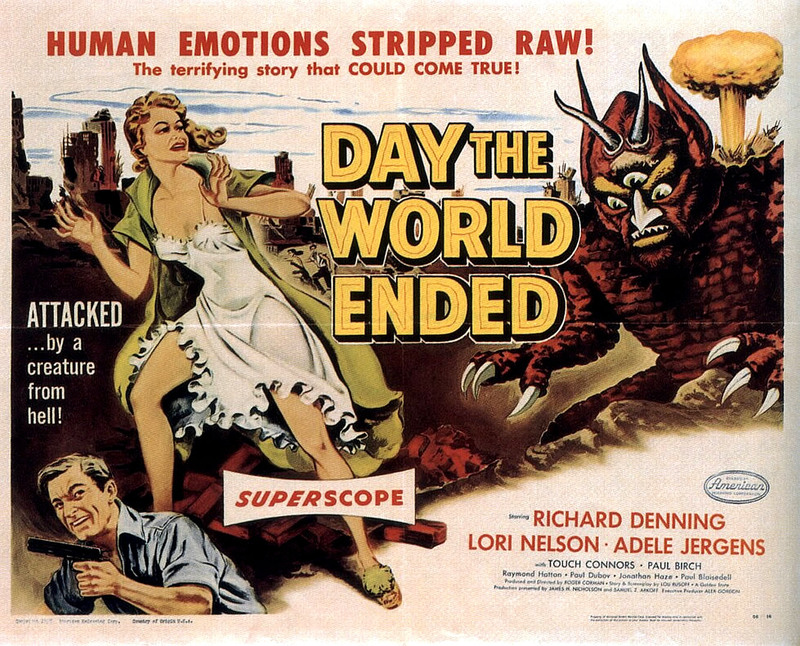 In December of 1955 a Roger Corman directed motion picture from a screenplay by Lou Rusoff entitled "The Day the World Ended" was released. The story is formatted like Arch Obler's "FIVE" in that we have a group of survivors of an Atomic War meeting, talking and interacting. The picture was released through what would become American International Pictures. They had a tendency to make posters to lure the audience in that was far better than what we saw on the screen. As Atomic Bombs explode and the world apparently ends giving Roger Corman his title. A radioactive cloud has stayed stationary over a canyon with lead lined walls. Believing, as was Obler's "FIVE", that lead will protect a person from radiation during and after a Nuclear War. The cloud creates its own dead zone which reaches slightly below the tops of the canyon walls. The owner of a house at the Canyon's bottom is an ex-Navy Commander who was part of the early Atomic Tests and became a survivalist over his fears of a Nuclear Holocaust. 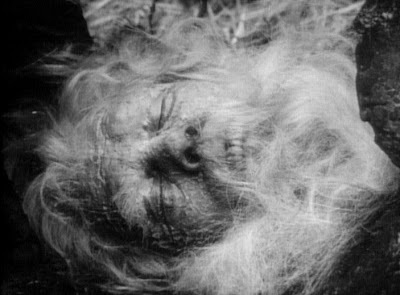 He stock pilled food, water and other supplies for three people to survive until the radiation level drops below dangerous. His daughter was engaged to a man who disappeared after the attack. The two have only one real fear and that is rain. It hasn't rained since before the nuclear attack and their fear is new rain will bring them death as it passes through the nuclear cloud. Into their twosome comes five other people. One is Rick a geologist, Then there's a small time gangster named Tony and his girlfriend Ruby. Also a old prospector named Pete with his burro and a man called Radek who was exposed to radiation andis starting to show it on his face. The food shortage becomes an immediate problem as will jealousy by Tony over the Commander's daughter, Louise, who is falling for Rick. There is a fresh water pond and the two women take a swim, but Louise thinks someone is calling her name. When we meet Radek it leads to the Commander showing Rick drawings, as photos weren't permitted, of test subject animals that survived for a time after the Atomic Bomb experiments he was part of. Eventually a man sized monster is observed that keeps going for Louise. Like Radek's skin which was becoming a form of armor as he started to mutate from the radiation. This creature has it's entire body covered in that armored skin. Plus the third eye on the sketch of the mutating monkey and the other smaller arms from its upper shoulders. The creature will kill Radek to protect it's small food source. The creature finally takes Louise, but tenderly and carries her away. Rick pursues as it starts to rain and he observes the creature fall to the ground and dissolves. The rain isn't radioactive, but clean and fresh and the creature can not live in a non-contaminated world. The Earth is restarting itself and destroying the pestilence man had created. Which would also be used in 1959 for the ending of "The World, The Flesh and The Devil". This picture starred solid "B" supporting actor Hugh Marlowe, who had played the boyfriend in "The Day the Earth Stood Still", and was the first American feature film for Australian actor Rod Taylor. These two along with Christopher Dark and Nelson Leigh leave the Earth in 1957 for the first trip to circle Mars. The mission goes better than as planned, but as they leave Mars orbit and head home something goes wrong with the propulsion system. The ship reaches speeds beyond the builders computations and the spacecraft crash lands on a snow covered mountain. The story really takes off from this point. The four men first discover the air is breathable, the radiation level is residual and far below even what a person would be exposed to with X-ray exams. They decide to explore below the snow line and venture out. The group makes a comment that the mountain range their in seems similar to the Rocky Mountains of Colorado back on Earth. They don't know it at the time, but that is exactly where they are. As the four men move further from the space craft. The groups comes upon a cemetery and a shocking discovery. They are back home, but from the grave markers sometime beyond a devastating Atomic War they speculate occurred in 2188. Later they will learn that in their time terms the year is actually 2508. The screenplay now explains how this happened by referencing "Time dilation". In Einstein's theory of Relativity this is the difference in elapsed time between two events measured by observers. In this case 1957 and 2508. Immediately a problem arrives with Christopher Dark's, far left in above still, Jaffe. He is the only married member of the crew and realizes his wife and children are long dead. He also speculates about unknown possible Grandchildren he will never know. Further exploration leads to a cave with a giant spider web and a mutated spider. 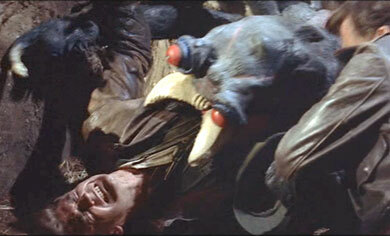 The group is then attacked by Mutated humans. Who like the Martian civilzation in "Rocketship X-M" have reverted to the stone age. The four men discover a cave during this attack and move back into it as shelter. Suddenly a metal door slides down blocking the outside world. Another opens further in the cave and they enter to discover an underground city of the still human descendants of those who survived the Atomic War four hundred years before. It will be discovered that although the women are still fertile. Living underground has started to turn the men infertile. This society refuses to go out into the now safe Earth for two reasons. The first is the obvious fear of the Mutates and the second they say they're comfortable were they are. However, besides the descendant's young women is a girl named Deena. It turns out that she is actually from the outside world and the Mutated population is very small. The Mutated humans are killing off or enslaving the now normal children being born like Deena. There's an ongoing confrontation with a man on the council named Mories. He is jealous over their leaders daughter falling in love with one of the men from the Earth's past. Mories felt Garnet would be his and he murders another council member. Then plant the guns, taken away from the time travelers, to blame them. Deena unobserved knows the truth, but she becomes jealous also. After she thinks Ellis, whom she now loves, is interested in another women. Deena finally reveals the truth about Mories. Who is banished to the outside world and immediately killed by the Mutates. Deena also reveals that like primitive people of the past. The Mutates choose a leader by combat. It is decided to challenge Naga for rule of the Mutates. Deena joins the four men as a translator. Naga is defeated and the few remaining Mutates are told by Deena the new leader wants them to leave and never return. As a result the underground dwellers return to the surface and joining with the normal born children of the Outer World to start life again. Also Jaffe finally finds solace in becoming a teacher for the children of both groups reflecting the film's title "World Without End". In July 1958 Roger Corman was back with a film that was originally to be called "Primitive World", but starred 25 year old Robert Vaughn as the title character the "Teenage Caveman". The film was called "Out of the Darkness" in the UK and that title actually fits better. To be honest the first 90% of this movie is a prehistoric reworking of sorts of James Dean's "Rebel Without A Cause". As it deals with "Mom and Dad you don't understand me". The title change was made to be part of the "Teenage" horror/science fiction aimed movie craze. It had been started the previous year with Michael Landon in a similar "Rebel Without A Cause" remix "I Was A Teenage Werewolf". 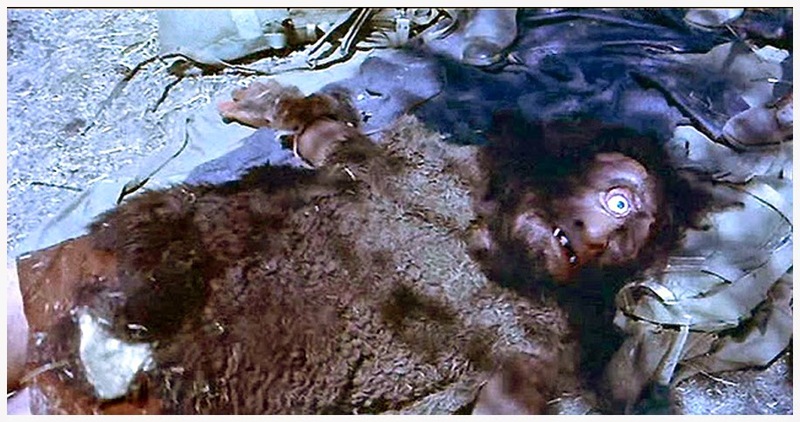 However, it is that last 10% of "Teenage Cave Man" that is of interest here and the reason I consider it, as others do not, a Nuclear Holocaust feature film. There is a legend in the Tribe about a God that lives across the river. The side the Tribe lives on is barren and rocky. While the God's side is lush and fruitful, but still they are never to cross over that river. Those who have never returned. Of course a group of teens including Vaughn's girlfriend cross the river with him. There they meet the God of legend. Robert Vaughn's "Teen" attempts to make peace, but another of his group is afraid. That person takes some stones and kills the God with it. Vaughn in turn kills that boy with a arrow from his bow. As the remaining group approach their God it appears the head is coming off. The head turns out to be some sort of headpiece. In fact the whole God's appearance is not what it seems as there is a very ancient man inside. What was thought to be a monstrous God was in reality a man in a radiation suit and the only survivor of the Nuclear Holocaust that destroyed the world. Eventually taking the survivors of mankind back to the stone age. As my reader by now knows a major prediction by Science Fiction writers of the period. As to the radiation protection suit. At one time it became covered with fallout and somehow it actually kept the man alive to roam the new world for decades beyond his normal human lifespan. Will humanity someday repeat its nuclear folly after civilization has once again risen to its former heights? 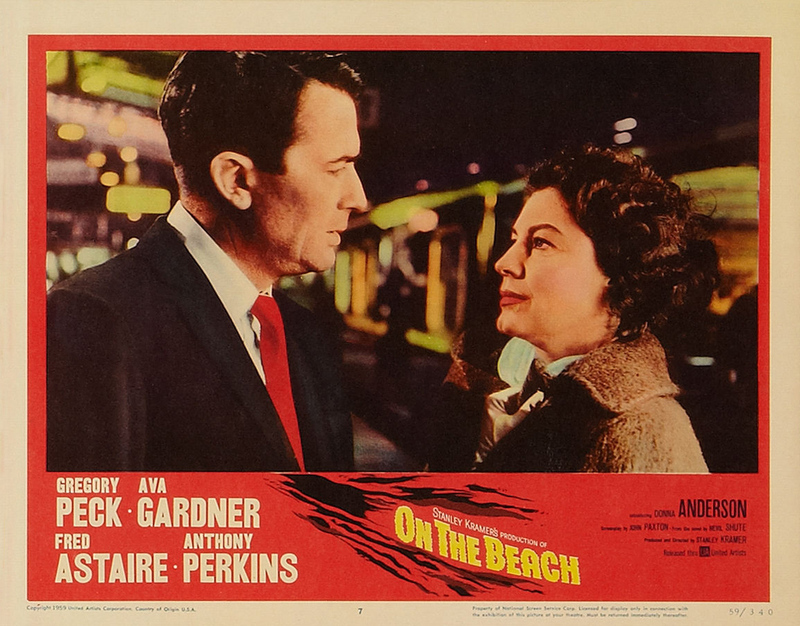 On December 17, 1959 Producer/Director Stanley Kramer released his version of British author Nevil Shutes 1957 novel "On the Beach".After all the above Apocalyptic Science Fiction fantasy. The motion picture industry got serious as events were overtaking the world. In three short years President Kennedy would be faced with "The Cuban Missile Crisis" with actual Soviet Union Nuclear Armed Intercontinental Ballistic Missiles just 90 miles off the Florida coast. "On the Beach" was an "A" picture with an "A" list cast. 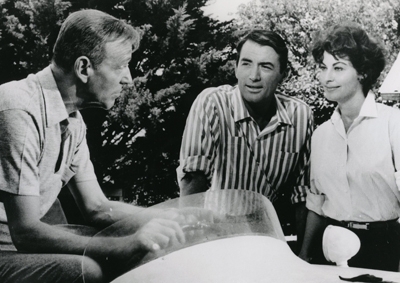 Stanley Kramer made many changes to Nevil Shute's novel and the author would not assist him, because of them. Gregory Peck was also upset about these changes, but while some were made for cinematic reasons and others because the United States Navy refused to cooperate with Kramer and he borrowed the Australian. The overall film is still very effective in making its point about Nuclear War and its result. The audience learns from a calendar on the wall of the home of Anthony Perkins character Lieutenant Commander Peter Holmes, Australian Royal Navy, that the year is 1964 only months after World War 3 has ended. A date that was reverting to the 1959 American audience who was now caught truly within the Cold War and that fear of Soviet Attack. The film mentions that Australia being in the southern hemisphere was not directly attacked during the war, but the radioactive cloud is slowly making its way toward the country. One of the last remaining areas of untouched humanity. Into the harbor of Melbourne comes the U.S. Nuclear submarine "Sawfish". It is under the command of Commander Dwight Lionel Towers portrayed by Gregory Peck. Lt Commander Holmes will be assigned to him as liaison officer from the Australian Navy. Actually the "Sawfish" is placed under Austrian Navy command as it is believed no other American Naval vessel still exists in the world. The Australian Government has been picking up a garbled Morse code signal from the West Coast of the United States. The plan is to send the "Sawfish" to investigate.Prior to the mission there is a party held one evening and Commander Towers meets two people. One is the alcoholic Moria Davidson, Ava Gardner, and the other a Scientist who will accompany him, Juliam Osborne, Fred Astaire in an unusual dramatic role. While the submarine still awaits its departure the audience follows these people and Lt. Commander Holmes. Holmes has acquired suicide pills for his family. These have yet to be dispensed by the Australian Government and will be shortly. So that people will not suffer the affects of radiation sickness before dying. Peter is having difficulty getting his wife Mary, Donna Anderson, to accept what's happening to their family and that if he is not at home. She will need to give one of the pills to their baby daughter and then take one herself. Moria has been attempting to get Dwight interested in her and her plans are running into the memory of his recently deceased wife. While Julian has been building a race car to run in what will be the last Australian Grand Prix. The "Sawfish" finally puts to sea and heads for Point Barrow, Alaska to prove one scientists theory. That theory concerns radiation levels near the Arctic Circle believed to be lower than in the mid-Northern Hemisphere, if true this indicates that the cloud will dissipate before it reaches Australia. The reverse is occurring as the level is actually intensifying. The submarine next reaches San Francisco and one of the crewmen whose family is in the city leaves the ship against orders. The next day he is seen fishing and tells Commander Towers that he could not locate his wife and children, but everywhere he goes people are dead. 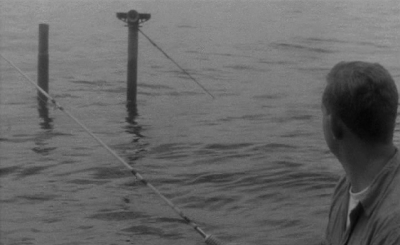 He says good-by and remains fishing in a boat awaiting his fate as the submarine dives. The "Sawfish" arrives at San Diego the source of the signal. A decision on how to locate it and the possible survivors is made. Lieutenant Sunderstrom volunteers to go ashore wearing a radiation protection suit. He has one hour to leave and return to the ship before his oxygen will be depleted and faces radiation sickness. Sunderstrom goes ashore and locates the signal that started the mission. It isn't a person, but a Coca Cola bottle tied to a window shade cord tapping in the wind against the Morse code set. He stands the Coke bottle up and uses the Morse Code set to explain the situation he has found and returns to the submarine within his hour. The "Sawfish" returns to Australia. Moria and Dwight finally fall in love as the end is nearing. 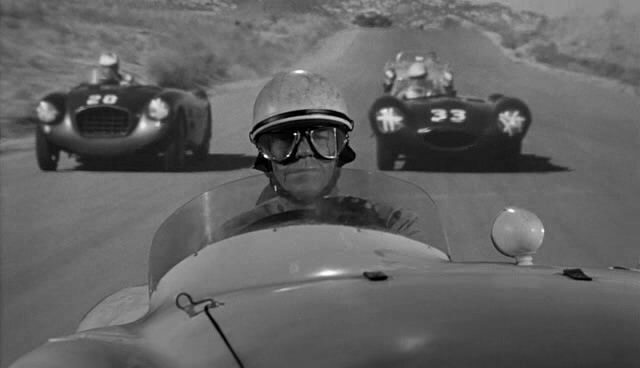 Julian enters the Grand Prix and while other drivers are crashing and dying the scientist wins it. However, fate catches up to everyone. Julian blocks the door of his garage and turns the race car's motor on to die by carbon monoxide poisoning. Mary Holmes has had a nervous breakdown but regains her senses in time to help her husband end their baby's life and their own as a family. Dwight is forced to leave Moria, because the crew of the "Sawfish" wants to return to the United States to die in their own country. 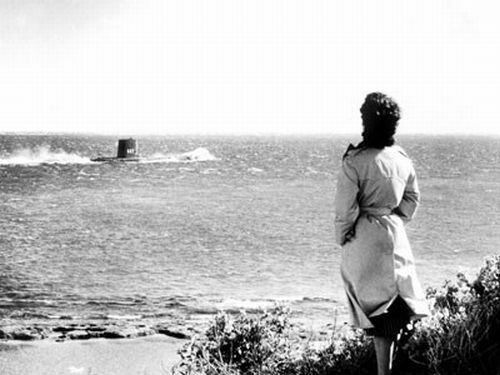 Moria watches from a cliff as the submarines heads to sea and diver under the ocean. She will take one of the suicide pills with a drink.